As elemental, at times, as a Greek tragedy, Adebayo’s debut is a visceral story of family betrayals grounded in what begin as an ideal love story. Akin and Yejide meet at college, fall in love instantly and marry quickly. But their comfortable, seemingly flawless existence in Nigeria, where Akin has a good job at a bank and Yejide runs her own hair salon, conceals fundamental deceptions and is marked by an aching void – the absence of children. As the novel opens, Yejide is faced with the fact that Akin has been pressured into taking a second, likely more fertile wife. Although Akin does his best to minimize the impact of this development on Yejide, a period of intense psychological disturbance follows. This is but the first in a sequence of desperate developments between husband and wife. 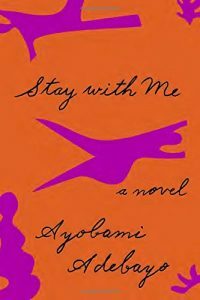 With expert pacing, Adebayo slowly peels back layers of truth about Akin and Yejide’s marriage, to reveal the substrata of lies on which it is built, and on which it will founder. 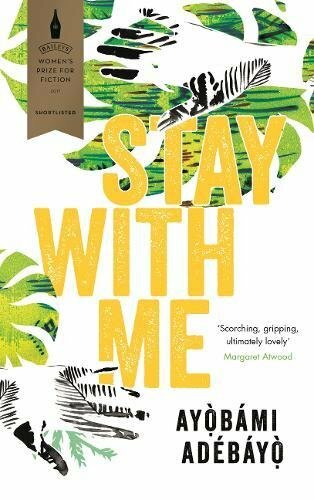 Stay With Me is a story of yearning, guilt and gut-wrenching loss, yet is expressed with remarkable restraint and delivered in the simplest of language. Sometimes it’s illuminated by folk tale; often the somber tone is diluted by the comic, chorus-like contributions of a coterie of secondary female characters. For a first novel, Adebayo’s is an strikingly impressive achievement, situating the domestic agonies of its two central characters against a deftly suggested, low-level background of Nigerian politics – the coups and countercoups, the fake elections and local violence. Graceful and unsentimental, poised and intense, this is fiction that plumbs depths. Adebayo is a new voice to relish.